Pauline Jaricot's Home, Lorette, Lyon, France, Then And Now. 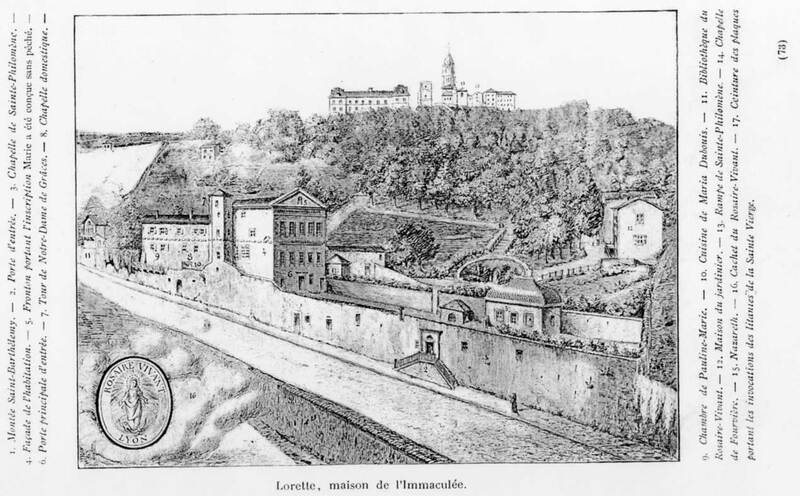 In 1832 Pauline Marie Jaricot acquired an estate 42, montÉe Saint BarthÉlÉmy, with an exceptional situation on the hill side between the Saint John cathedral and Fourvière, a unique view over Lyon and its outskirts. Elevation view of Pauline Jarictot's Home, Lorette. The Lorette house was built on roman ruins, and the first documents dating back to the beginning of the 16th century refer to a building called "house of Breda" describing two main independent buildings side by side, flanked by a tower and surrounded by meadow down to the foothill. Very Old Etching of Pauline's home. Throughout the centuries the mansion has had several owners and a few famous hosts. 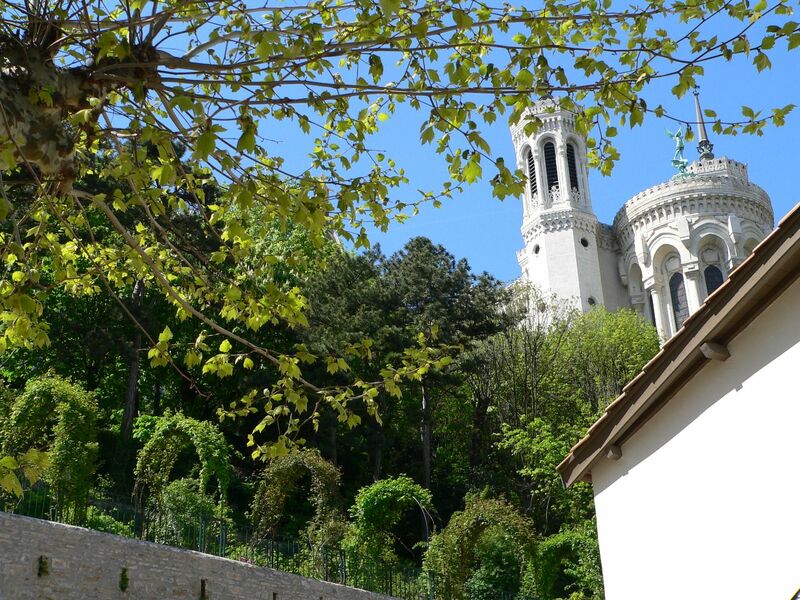 View of Basilica of Fourvière above and behind Pauline's Home in Lyon, France. Such as King Henry the IVth who lodged his mistress Gabrielle d’EstrÉe Marquise de Monceau there, a few days before her solemn entry in Lyon on September 4, 1595. In 1832 the house is purchased by Pauline Marie Jaricot, together with several pieces of land for various religious communities. Front View of Main Entrance of Pauline's Home. 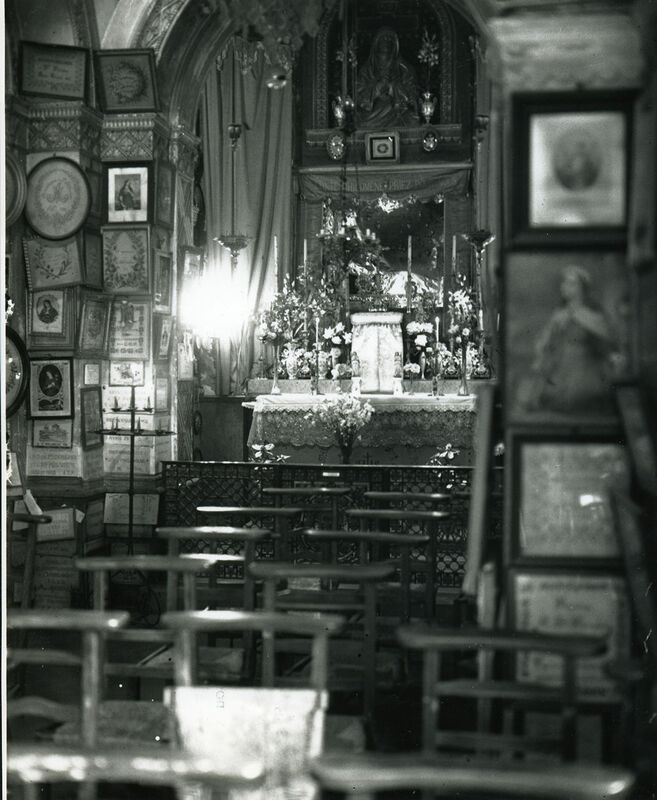 She had a chapel dedicated to Saint Philomena as well as outbuildings; she also had the house re-handled to host the main office the "Living Rosary Institution". She named this house "Lorette" in memory of the Lorette sanctuary in Italy where the walls of the Annunciation house are installed. 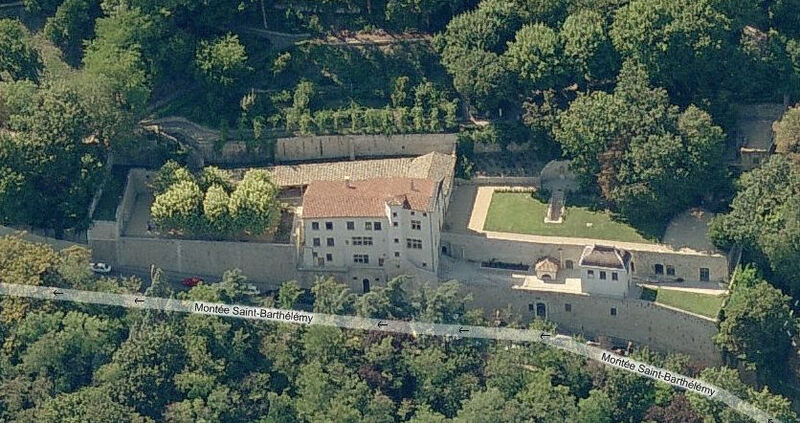 Aerial View Showing Pauline's Home. In 1851 after the bankruptcy of the " Our Lady of the Angels" factory, in order to pay back her creditors, she opened a toll staircase giving access to the Fourvière sanctuary which was only a simple chapel topped by a golden statue of the Blessed Virgin by Fabisch. After her death in 1862 the Fourvière Commission, engaged in the erection of the Basilica, purchased the house. 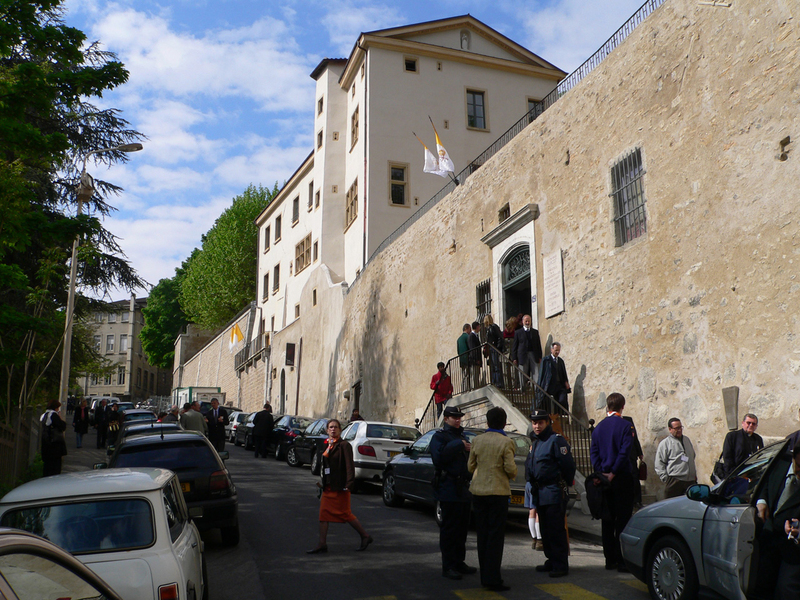 In 1975 the Fourvière Commission sold the house to the Pontifical Mission Societies. Sainte philomÉne Chapel at Lorette, Where the Bishop Offers Mass Once a Month. 200 years after Pauline Marie Jaricot’s birth, the PMS decided to give a new life to her house of Lorette by launching a large renovation program. Their will is to keep the patrimonial interest of the site as well as to establish the spiritual heritage of Pauline Jaricot and give a new momentum to the missionary work of the Church. 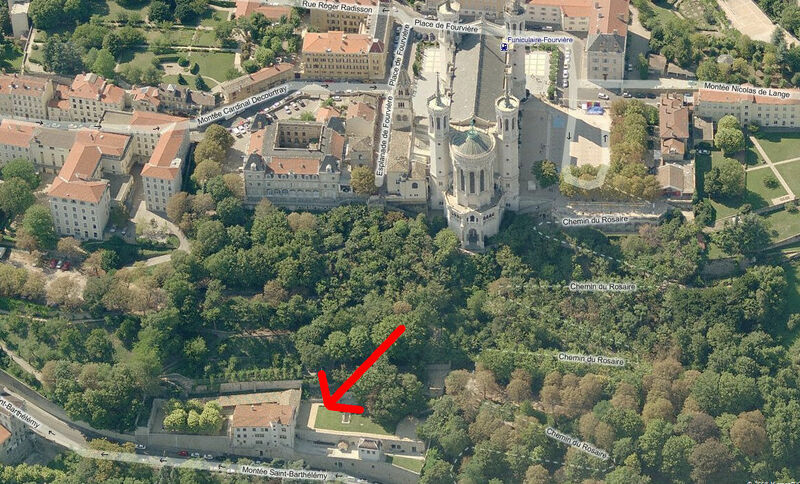 Aerial View Showing Pauline's Home in Relation to the Basilica of Fourvière Behind and Above it.